Study says ICE Holds are Costly and Harmful. An “ICE hold” (or “ICE detainer”) is when local police hold an individual in jail who would otherwise be released until the person can be transferred to federal custody for deportation by Immigration and Customs Enforcement (ICE). A University of Washington study released in March found that King County, WA could save up to $2 million dollars if they did not honor ICE holds. They also found that undocumented immigrants with ICE holds are held in local jails for up to 30 days longer than those without ICE holds. 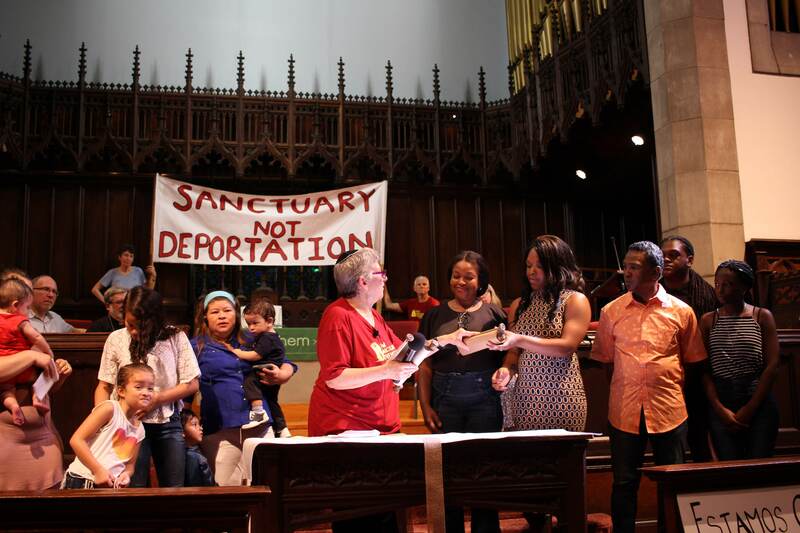 NSM’s local organizing campaign fights to end collaboration between the Philadelphia Police Department and ICE, including ICE holds that result in mass deportation. Deportation System Flow Chart – A flow chart describing the steps between immigration raids and deportation. Secure Communities Explanation – Provided by the National Immigration Forum, this document provides a brief explanation of the Secure Communities Program, how it differs from 287(g), and why it is harmful to public safety. Overview of the Key ICE ACCESS Programs – An overview of the key ICE ACCESS Programs – 287(g), the Criminal Alien Program, and Secure Communities – put out by the National Immigration Law Center. Justice Strategies Report – This report, put out by the nonprofit research organization Justice Strategies, provides an in depth look at the 287(g) program. Secure Communities Report – This report, written by Michele Waslin of the Immigration Policy Center, talks about the problems with the Secure Communities program and offers some recommendations for improvement. Defending Human Rights & Due Process – A policy brief from the DHS-NGO Enforcement Working Group on the problems police-ICE collaboration poses for human rights and due process. For You Were Once a Stranger – A congregational handbook that can be used by religious leaders as a resource study guide, immigration study and discussion circle with your peers, resource for organizing an event such as a round table discussion or day long conference. Uncover the Truth Toolkit – A toolkit designed to help advocates respond to ICE enforcement programs in their communities: to research what programs are operating and how they work, ask questions of police and politicians, join forces with allies, and follow up formal requests for information under federal and state law. What Part of Legal Immigration Don’t You Understand? – Opponents of illegal immigration are fond of telling foreigners to “get in line” before coming to work in America. This exercise shows what it actually looks like to get in line and how many years (or decades) it takes to get through. De Redadas a la Depotracion / Des Raids Aux Explusions / From Raids to Deportation – A Community Resource Kit about how to respond after a raid, locate someone in detention, get them out of detention, and put together a community response. Conozca Sus Derechos! – Learn how to protect yourself and your family during immigration raids.